For the first mini episode, Kate and Jack tackle the book that is the origin story of the podcast. Sure, a George RR Martin novel about the dark and violent side of the 60s focusing on ritual murder and a band called the Nazgûl sounds amazing, but is it? No. No it is not. Armageddon Rag has taken on borderline symbolic value to your hosts as the quintessential work of wasted potential. How sad is it when middle aged people worry about "sell outs?" Are all young people doing counterculture wrong, or are hippies just the worst? How many uncomfortable sexual elements are incorporated into the plot? Why would anyone name their magazine The Hedgehog? 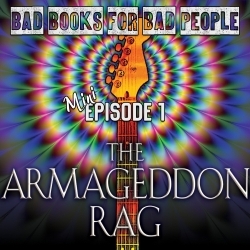 Find out all this and more in the first mini episode of Bad Books for Bad People.